This was my 7th marathon and as all the others before, I used the same sane principles of a Hanson’s training plan but with some adjustments: kept the Tuesday workouts (but at MP-15/sec/km), moved the tempo runs on Friday (because work) and longer (than 16 miles) long runs Sundays. I also took the day off when I actually needed it. Before going into marathon specific training, I did a cycle of 18 weeks to prepare the Oxford Half Marathon where I ended up running a new PB: 1:23:49. Right after, I build my volume back to 90km/week then sat for 3 weeks at 100km/week. Progression between the half and marathon was: 60km/88km/92km/95km/99km/100km/100km/107km/72km/race-week. Something in my hip got a bit sore after the last 32km long run, but heading into the taper, I cut the volume of the easy days while keeping the last 2 workouts on pace; so instead of 84-86km planed, I settled for 72km and a day off. Based on the key workouts at marathon pace: 21.1km @4:06/km, 16km @4:07/km, 17km @4:05/km, 16km @4:05/km my race goals for Pisa Marathon were: A) 2:54, B) PB < 2:57, C) BQ2020 < 3:05. I was really worried about Pisa being colder than my usual training weather, however a short shakeout the previous day made me realize is not actually that bad. We had 2°C at the start and maybe 4°C at the finish. It was overcast with rain expected later in the day. A moderate wind breeze was noticeable, especially when faced directly and the cold chill was reaching my skin left unprotected by the running gear. The night before, I highlighted the course over a map with the city center and wrote down the race plan, like where to take the gels and what splits I should reach at half and 30k, why am I entitled to go at 2:54 and my goals. The last one was: DON’T GIVE UP. I woke up at 6:17 after hitting snooze once. I had a light breakfast and 2 macchiatos later, I head out to drop the bag while sipping from a half liter bottle with a mix of Maurten 320. There’s only one start box for everyone and it is chaotic as runners aren’t placed based on their times. In a big group about 2-3 meters from the start line, there are about 30-40 pacers of various paces each carrying yellow balloons thus not helping anyone spread evenly in the box. We’re more than 3000 runners participating in the full and half races. Somehow I have luck and I find myself on the right side of this group, very close to the start line. At 9AM we’re off. Elbows are flying in all directions, a lady felt in a perfect superman pose and a kind fellow runner helps her by making a wall. I dodge them both. Don’t go out too fast. I start with my lucky orange headband on, only to take it off early since it didn’t felt too cold. 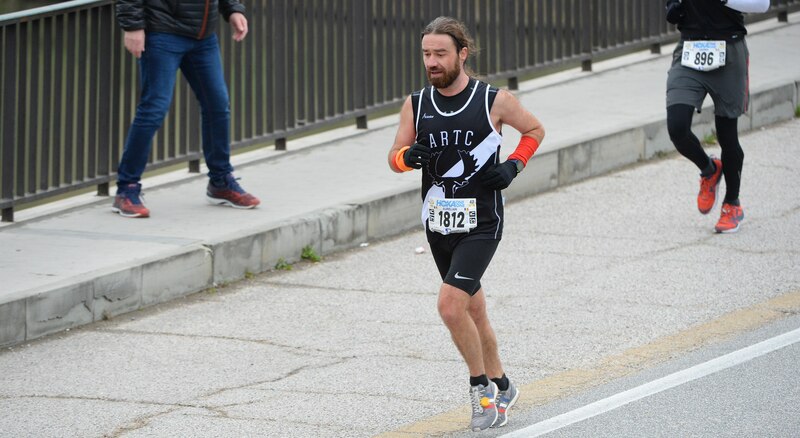 To complete the tour of my racing gear, I had the european bootleg edition of the ARTC singlet with the Under Armour tank underneath, red HOKO arm warmers and Reebok gloves. I went with the Nike tights instead of the Adidas split shots just to get some extra compression and warmth around the upper leg muscles. And finally I was rocking the same pair of Adidas Adios 3 AKTIV that I had at the 2018 Barcelona Marathon in the spring. I settle into a relaxed pace as we move around on the Arno river banks. The only remarkable thing is Ben Parkes - which at that time I had no idea he’s a known influencer who ran 2:25 only 2 weeks before at the Valencia Marathon - shuffling with a camera. We left the city behind after 5km in 20:40. I skip the water stop. Well, so I’m running this thing, not much going on. I start the Maurten gel that I had in my left glove at km7 and finish it by 8. I like boring. Some volunteers are handing out sponges. WTF. I grab one out of respect for them enduring this weather and wipe a bit the sweat off my face. Obviously my glove is now filled with cold water. Well. Chip control is somewhere at 9.5 kilometers - on the results page it appears at km 10, making everyone faster. Soon after, on a highway overpass I pass the 10km marker in 41:12. And again I skip the water stop, it was just too small and under-served and I couldn’t see anyone handing bottles. I’m not worried thou. It looks like we have a nice pack going and I ask what pace everybody is shooting for. quattro cinque comes the answer. You’d better hurry then, ‘cos we’re doing 4:07-8/km. I didn’t hangout too much, it felt like the group was going too slow for my taste and I didn’t came to make friends anyway. 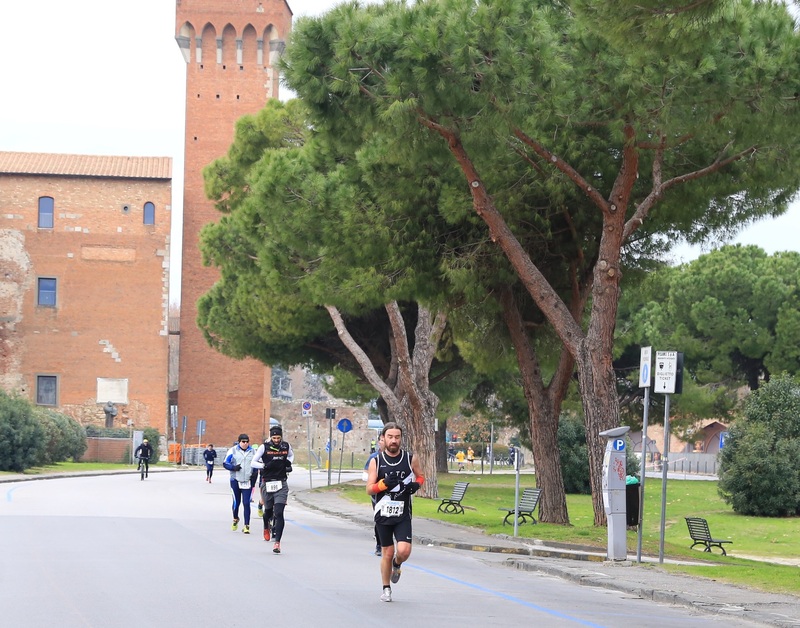 At around 13km the course splits with half marathoners making a right turn to go back to Pisa. A volunteer is shouting after someone that was supposed to do the full but went on the half course, to which the runner replied she’ll have enough with the half today. I’m left alone, so I keep it boring by reaching the back pocket of my tights and getting a second Maurten gel in from km 14 to 15 and then I finally grab a bottle of water which to my surprise was half emptied. It’s very cold and I take my time taking small sips out of it. I’m prone to side stitches and in training I noticed that either the cold water, or Maurten or maybe both can induce one. I throw the empty bottle at the 16km marker. We’re cruising through a forest and I commit to keep a mental game counting by how much I’m off 4:07/km pace for the next 16km. There’s chatter happening few meters behind between a guy and his friend riding a bike that kept me company for a while, then out of nowhere a volunteer dressed up as Santa with a bag full of sponges. WTF. I do pass someone that looked really cooked at this stage of the race and then I catch up with a guy that stays with me for 500 meters, until 18k when we reach Tirrenia, the sea side. Humans! There’s even a band playing in front of a restaurant, can’t remember the song (was it “I will survive”? ), but the singer had a really high pitched voice. This is an out and back section and I try to entertain myself checking out the race leaders and the runners on the other side of the road. At 20k, not spotting anyone handing water bottles, I grab a plastic cup from a table. Took one sip as the plastic broke and water flied all over my face. Not a good idea. Half 1:26:45. Bit of a hot pace I reckon, but checking the mental math, in the past 5k I had gained only 5 seconds over that 4:07/km target, so I concluded that my push wasn’t that absurd. I haven’t had much time to worry if I was too fast, because right after the half, as I was opening the third Maurten gel, the course does the 180° turn and right away I notice two things: 1). the wind speed and direction by observing some flags in the distance and 2). the 22km marker completely off by 300-400 meters. Now, the second thing made me really nervous. The next marker was also off. Then the next. I skip water at 25 and I make some gestures at the marker that was obviously off, some fellow runner next to me smiled and acknowledged it by shrugging. I was only thinking that the course will be short. All those months of preparations to run a shorter distance. Will it be a valid BQ? What if I PR but it’s short? Should I tell anyone? Should I go back and run the missing distance? It’s a 7k stretch in a straight line with all the markers off by considerable distance. The other side of the road is packed with cars stuck in traffic. With engines on, they aren’t going to move soon. Drivers honking to signal their discomfort. Through car fumes, for a second I thought they are cheering us. However, my pace is still even. Right at the end of Marina di Pisa the km 29 comes and I feel relived as this marker matches the GPS. I delay the next gel. I can’t remember if I had water but I do know I crossed the chip control at 30k in 2:03:26. That’s 4:06-7/km. I’m ready for a big day. Soon after I check the Garmin and it shows 4:20 as my current pace. Wat? Then I start to feel the cold. Then I notice the wind. I accept 4:18 as the next split. All my build up in the last 14k, gone in 1k. I let it go and open the forth Maurten. Don’t fight the wind, I’m telling to myself, as the next 4:18 split comes. Keep the effort constant, I continue my story and a 3rd 4:18 in a row is in. Course makes a slight change of direction and now the wind is lateral-head. 4:25 another split. My calves are burning. I close to a runner in front and I pass him really fast. I’m hurting, but it’s gonna be a longer day for him. I grab a bottle of water at 35 and take 2 maybe 3 sips. It’s cold. C’mon, the wind is not that bad, let’s get those legs rollin’! Nope. I look up in the distance and I get dizzy if I try to focus on something further than 10 meters. I lost count of how I’m doing with the 4:07 goal. I pass a lady running in sub2’s which I vividly recall her passing me at 24. 2 guys fly by on my right and I attempt to stay with them, 50 meters, 100, maybe 150 but I can’t keep up. Dizzy, with both lower calves on fire I start to think that this might be the wall. DON’T GIVE UP. Road is partially opened for cars on the other side. On mine, a group of “dirty triathletes” on their Sunday ride pass close to my left shoulder. For a second I wish I could draft of them. I’m fully aware of my dizzines as I’m putting effort into moving in predictable pattern and not fall under the wheels of someone’s bike. A car hits a traffic cone which gets stuck between the bumper and the road but the driver doesn’t feel like stopping soon and the cone dragged on the asphalt makes a terrible noise. At km 38 I check the total time - 2h 38 on my Garmin and realize I can still run a sub3 closing with 4k at 5/k. C’mon, with a second half in 1:30 I can even do a 2:56. This thought fires me up. Usually I don’t make much noise while running, but now I hear my feet slamming the pavement, sending pain up on both of my calves. There’s chatter behind, a group of 6-7 is approaching. One is really vocal shouting encouragements in italian. I just need to stay there with them for as long as I can. The sub2 lady is also there. Can’t remember if I took water at 40k, probably not with 2k to go, I’m not gonna die dehydrated. A quick glance at the watch and realize I can PR if my calves are not going to cramp. We cross the river and we’re now back to the city center. The tightness surrounds my Achilles and I have trouble rolling the ankle joint. On both legs. 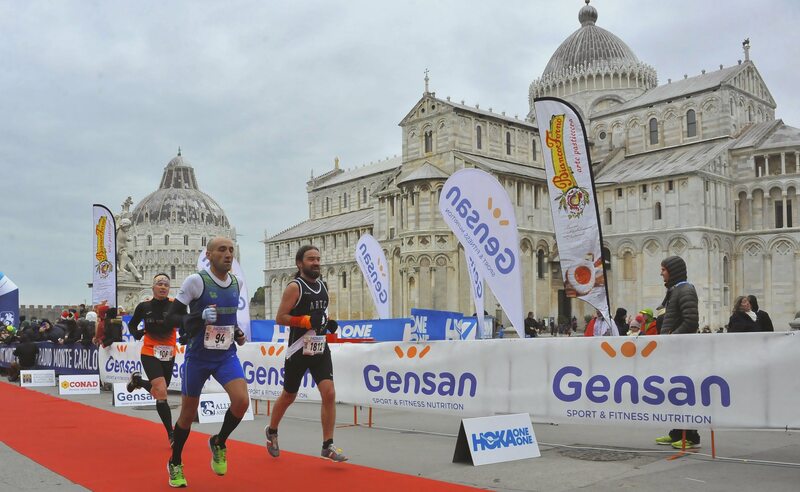 The group dissipates with 1k to go at the first sight of Cattedrale di Pisa. A sharp right turn, the Tower and 20-30 meters to the finish line. I force a smile while making the Leaning Tower pose jogging casually over the finish line in a new PB: 2:56:26 (1:26:45/1:29:41). I DID NOT GIVE UP. I also did not end up in a medical tent. I did not cry, as the announcer suggested, I was just holding my head in my hands covering my face and nose so I can breath warmer air and make the dizziness stop. I collect the medal while someone wraps a space blanket around me. I’m happy with the performance although I PRd by seconds. I executed the plan as I had it laid down, the wind had influenced the outcome thou I really think my race was lost between 22 and 29 where I wasted a lot of energy on something that was completely out of my control: the kilometer markers being off. The water stations were not predictable and not having water when needed was also stressful. Overall, I went into this race with the wrong mindset, I should have chilled the f&!k out and take everything as it is. 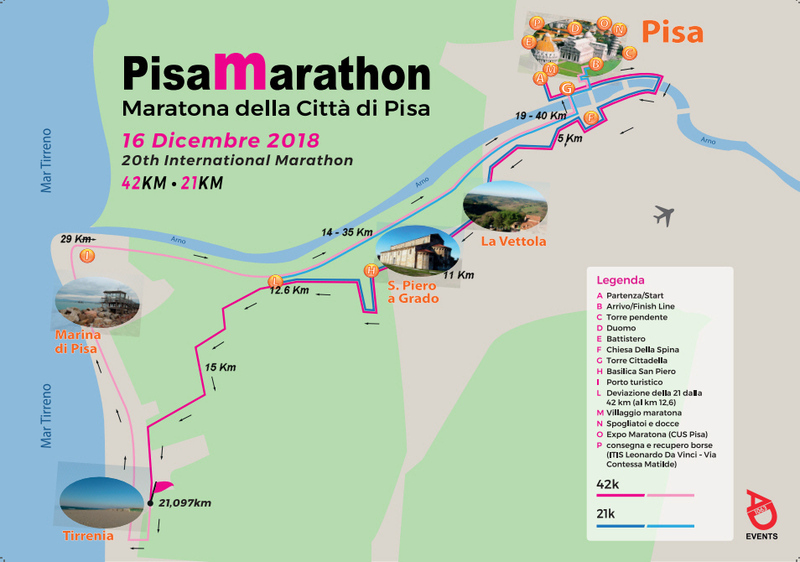 I knew Pisa Marathon won’t be the big breakthrough marathon that I’m striving to make. For this to happen I would need to run more and maybe train smarter.